I always felt Donna Summer belonged in the second tier of female soul singers, below Aretha, Gladys and Dionne and alongside Irma Thomas, Candi Staton and Dee Dee Warwick, which isn’t bad company. What she had going for her, the thing that marked her out, was a hint of sadness in her tone. Even when she was at her most exultant and ecstatic (the obvious examples being “Could It Be Magic” and “I Feel Love”), there was a darker emotional undertow. I imagine it was that sense of ambiguity which caught Giorgio Moroder’s attention back in the mid-’70s. And somehow it was rendered even more potent by the contrast with the Munich producer’s machine-tooled beats. Long after she and Moroder had parted company, she put her name and voice to a pop-disco masterpiece that illustrates better than anything what I’m trying to describe. And it came, much to my astonishment, from the team of Mike Stock, Matt Aitken and Pete Waterman, with whom Summer decided to work after hearing the hits they’d made with Rick Astley. That was in 1987, and things weren’t going well in her relationship with David Geffen’s label. Her last hit, “She Works Hard for the Money”, had been four years earlier. Looking for a new angle, she made an album with Stock, Aitken and Waterman. But when Geffen heard it, he didn’t like it. As Waterman relates in the notes to the newly remastered and expanded reissue of Another Place and Time, the record company president asked for more guitars. Waterman, quite properly, told him where to get off and a stalemate ensued. To break it, Rob Dickens, the head of WEA, Geffen’s European distributors, played the unreleased album to Ahmet Ertegun, who loved it. Which is how it came to be released, on the Atlantic label in the US and WEA in Europe, two years after being made. And how Donna Summer came to make her way back into the top 10 in the US and the UK with a perfectly standard, upbeat and affectless SA&W song called “This Time I Know It’s For Real”. But the track Ertegun heard first, and the one that sold him on the project, was the one I’ve always been crazy about. Another SA&W composition, it’s called “Love’s About to Change My Heart”, a slice of pure pop-soul-disco that plays to every one of the singer’s strengths. From an out-of-tempo intro to a Moroder-ish four-on-the-floor that qualified, in 1989, as a retro gesture, aided by the producers’ meticulous attention to building and releasing tension constantly throughout the track, Summer takes a good tune and a lyric worthy of Hal David — “I’m waiting for the doorbell to chime / I always lived one day at a time / I thought that I was getting on fine / Never felt that I was alone until you changed my mind” — and soars. Give her a song like this, and she could make it sound like she’d lived it. The three-CD reissue of the album contains many remixes and offers no fewer than nine versions of “Love’s About to Change My Heart”, which shows what a dancefloor favourite it was, even if it failed to make much noise on the charts. But the version I love is the first one I heard, the producers’ own mix for the original issue on a 45rpm single. Everything about its beautifully detailed three minutes and 43 seconds is perfect, including two moments of absolute pop transcendence created by the producers. The first comes at 2:24, when Summer is reflecting on her changed emotional state. “What did I know?” she asks, and her own voice suddenly appears from another direction, overlapping and repeating the final syllable with a gospel howl, like her subconscious mind bursting out from beneath the narrative. If you were dancing you’d throw up your arms and howl along. And then, at 3:02, the pounding 128bpm rhythm is cut for a full 10 seconds, leaving Donna and the backing choir hanging in the air, a cappella, until the beat comes crashing back in, with the choir commenting — encouraging or warning? — like a Greek chorus: “Changin’… changin’… changin’…” until Donna joins in — “Change me… change me…” and the piece starts to fade. Weirdly, that touch of genius isn’t on the album version. Luckily, the single version is the last of the nine extra mixes on the third disc of the reissue. It’s a record I’ve loved for 25 years. In fact I’m going to play it again now, over and over again, as loud as I can get away with. 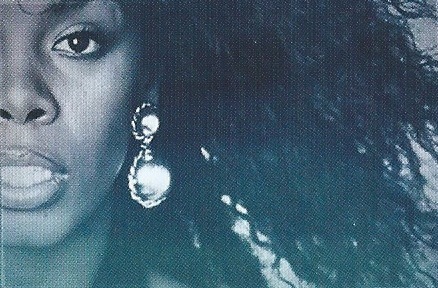 * The photograph above appears on the reissue of Another Place and Time, on the Driven by the Music label, credited to the Donna Summer Archive. One of the many things I like about your reviews is that you inspire me to search out whatever it is you are reviewing. I’ve never had any Donna Summer in my collection (though I did hear some of the hits on the radio) but now I’m semi-seriously considering investing in a 3-CD reissue of an album I’ve never even heard of. Good work! Thanks Richard I missed that at the time. I have always found her great concept album Bad Girls exhilarating but deeply sad at the same time. Even before Aids. Wow !! Love Donna Summer……..Never heard this before. Great record. Thanks for the heads up Richard. ‘State of Independence’ is an album I’ve always liked – produced by Quincy Jones, I think. Thanks for the recommendation. Look forward to hearing it. I agree with the emotional tone, almost a longing, in I Feel Love. I DJed at a birthday do on Saturday and took my ancient 7″ of that track – it’s a beloved single of mine and many others. If you asked for my favourite vocalists I may not pick Donna, but she played a crucial role by collaborating with Moroder. I’ve loved Donna Summer – unconsciously, at times, perhaps – since a disheveled summer in late 1980s Liverpool. Then, the pubs and clubs bounced to ‘This Time I Know It’s For Real’ – but i’d forgotten how beautiful the rest of her SAW-produced output was until i read your recent post.. I have listened to nothing but the 7″ of ‘Love’s About to Change My Heart’ since i bought the record last Saturday (after reading your last post). Thank you. Those in search of unadorned, honest, yearning, beguiling and beautifully balanced pop need look no further. Are you sure about Candi Staton only being a Championship singer, though? Perhaps a quick re-run through ‘In the Ghetto’ will convince you of her worth? Could a rapid promotion to the Prem be in the offing? Many, many thanks – for all your posts. Great piece, I’d also recommend Donna’s amazing version of ‘Lush Life’ from the 1982 Quincy Jones-produced self-titled album. A stunning vocal performance and great arrangement by Dave Grusin. I feel that Donna’s masterpiece is the Once Upon A Time album. So many great songs, but that moment when Say Something Nice explodes into life from Fairy Tale High is just wonderful. Thank you Richard for reminding me of her renaissance a decade or so later. Algo sabia de Donna Summer por informacion de mi madre que su juventud se centro en la musica disco de los 70s ,para el año 1988 quede prendido con el sonido de stock aitken waterman ,con artistas como kylie minogue,rick astley ,bananarama ,etc .Recuerdo 1989 cuando se libero this time i know its for real ,corri a comprar el casette ,Han pasado 29 años y aun adoro el album completo .Supe que grabaria un segundo disco con SAW incluso grabo los demos, pero nunca vio la luz ,me parece que hubo problemas con el sello discografico Algunos singles de ese disco se los dieron a Lonnie Gordon y tuvieron buenos resultados en las listas uk.